Karajan meets Murder Incorporated! What a meeting of minds and sensibilities! Hardly had Leonard Bernstein taken the helm in New York than along comes this European fellow to conduct it in Viennese classics – to be honest, the Webern hadn’t yet become a classic, this was only 13 years after his death and he was still a seen as a “difficult” composer. Karajan is totally at home in this repertoire, but he fails to bring to his performances an old world charm. As can be expected these are, what we now see as, old fashioned. Mozart suffers the most with an orchestra which is far too big, compared to what we are now used to – although it must be said that the Webern Movements - Pristine calls the work Five Pieces, which would be Fünf Stücke, but the correct title is Fünf Sätze, Five Movements - gain in strength and weight for the use of a large string body. Throughout there is the heavy hand of “authority”. The tempi are well chosen, even if the finale is brisk, and there’s never a dull moment, but Mozart deserves more than this kind of treatment. One wonders if the inclusion of Ein Heldenleben, in the second half of this concert, prompted the use of such forces? The Beethoven performances were given a week later, and what a change there is in the size of the orchestra and the interpretations for this concert! The 1st Symphony has well chosen tempi, and there’s more of a classical feel to the performance, but it’s still heavy-handed at times and too strict, with little give and take. The Ninth is a very fine affair. 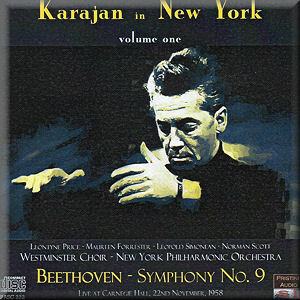 Karajan has the New Yorkers breathless, as he launches a first movement of great power, with a fine Allegro which is a little maestoso; just what Beethoven ordered. There’s little time for rest here and whilst Karajan ensures that he has a firm hand on the proceedings, there’s still an element of real fantasy to the interpretation. He had me wondering what was going to happen next! The scherzo is another matter. Although the tempo is well chosen, Karajan ignores both repeats in the first half, which is odd considering the composer so obviously wanted the sections to be heard twice; he wrote twelve first time bars at the end of the second section, but you cannot play these without playing the first repeat. It’s all to do with symmetry. In this performance the first movement plays for 15:07 and the scherzo for 10:40, whereas if Karajan observed the repeats it would have played for 13:46, balancing the allegro perfectly, which is what Beethoven intended. There is another, slight, problem. Once Karajan has chosen his tempo he’s away but he keeps having to, almost imperceptibly, slow down to allow for clear woodwind articulation. You will feel this, and, because he does it often, you will begin to wonder where the momentum has gone. That said, this is a thrilling exposition of the scherzo and so good that it makes one weep at the two miscalculations listed here. The slow movement is a trifle hard-driven, Karajan refusing to let go and simply allow the music to play. He builds the climax well, but it is just a part of the whole, rather than the achievement of musical discussion. Then we come to the finale, which, for me, is a real problem. I have two niggles. First of all, Beethoven was not a vocal composer so his “big tune” works marvellously when played by the orchestra, but sounds cumbersome when sung. Second, the tune itself; it isn’t strong enough to carry the kind of symphonic argument Beethoven is desperate to achieve. As a symphonic finale it is a failure, for it contains no musical apotheosis, and after three magnificent movements if any Symphony needed a really satisfactory musical conclusion, this is the work. Here, the singers are good – the women are much better than the men – but never do I feel the sense of exaltation which is supposed to infuse the music. Having said all that, these are exciting performances and see Karajan weaving a little of his magic with an orchestra which is known for not taking any prisoners; hence its nickname. The sound is very good, but there is little bloom on the upper string sound, and quite clear. These two disks are not for general listening but there is much to enjoy and admire and I am glad to have them in my collection, even if they couldn’t be my first choice in any of the works, except, perhaps, the Webern. Well done, Pristine Audio for giving us the chance to hear a couple of Karajan’s very rare American appearances.